A radially polarized beam is axially symmetric and is able to produce tightly focused light fields beyond the Gaussian beam diffraction limit. However, with the current technology, its duration is limited by the relatively narrow bandwidth that the generation techniques can support. Using a 10 cycle pulse with a central wavelength of 1.8 μm, we show that radially polarized beams can be compressed to the few-cycle regime, while still maintaining their radially polarized nature. Therefore, it seems feasible, using only well-developed methods, to reach focused intensities of ∼1019 W/cm2. Conversion via high-harmonic generation will also open a route for applications in attosecond science, especially for a wide range of optical measurements and optical control that require high spatial and high temporal resolution. Q. Zhan, “Cylindrical vector beams: from mathematical concepts to applications,” Adv. Opt. Photon. 1, 1–57 (2009). B. J. Roxworthy and K. C. Toussaint, “Optical trapping with π-phase cylindrical vector beams,” New J. Phys. 12, 073012 (2010). R. Chen, K. Agarwal, C. J. R. Sheppard, and X. Chen, “Imaging using cylindrical vector beams in a high-numerical-aperture microscopy system,” Opt. Lett. 38, 3111–3114 (2013). M. Meier, V. Romano, and T. Feurer, “Material processing with pulsed radially and azimuthally polarized laser radiation,” Appl. Phys. A 86, 329–334 (2007). B. Hafizi, E. Esarey, and P. Sprangle, “Laser-driven acceleration with Bessel beams,” Phys. Rev. E 55, 3539–3545 (1997). C. Varin, S. Payeur, V. Marceau, S. Fourmaux, A. April, B. Schmidt, P.-L. Fortin, N. Thiré, T. Brabec, F. Légaré, J.-C. Kieffer, and M. Piché, “Direct electron acceleration with radially polarized laser beams,” Appl. Sci. 3, 70–93 (2013). G. Milione, T. A. Nguyen, J. Leach, D. A. Nolan, and R. R. Alfano, “Using the nonseparability of vector beams to encode information for optical communication,” Opt. Lett. 40, 4887–4890 (2015). D. Pohl, “Operation of a ruby laser in the purely transverse electric mode TE01,” Appl. Phys. Lett. 20, 266–267 (1972). M. Stalder and M. Schadt, “Linearly polarized light with axial symmetry generated by liquid-crystal polarization converters,” Opt. Lett. 21, 1948–1950 (1996). M. R. Beversluis, L. Novotny, and S. J. Stranick, “Programmable vector point-spread function engineering,” Opt. Express 14, 2650–2656 (2006). M. Nisoli and G. Sansone, “New frontiers in attosecond science,” Prog. Quantum Electron. 33, 17–59 (2009). M. Nisoli, S. De Silvestri, O. Svelto, R. Szipöcs, K. Ferencz, C. Spielmann, S. Sartania, and F. Krausz, “Compression of high-energy laser pulses below 5 fs,” Opt. Lett. 22, 522–524 (1997). B. Schmidt, A. Shiner, P. Lassonde, J. Kieffer, P. Corkum, D. M. Villeneuve, and F. Légaré, “CEP stable 16 cycle laser pulses at 18 μm,” Opt. Express 19, 6858–6864 (2011). W. J. Tomlinson, R. H. Stolen, and C. V. Shank, “Compression of optical pulses chirped by self-phase modulation in fibers,” J. Opt. Soc. Am. B 1, 139–149 (1984). M. Nisoli, S. De Silvestri, and O. Svelto, “Generation of high energy 10 fs pulses by a new pulse compression technique,” Appl. Phys. Lett. 68, 2793–2795 (1996). P. B. Corkum, C. Rolland, and T. Srinivasan-Rao, “Supercontinuum generation in gases,” Phys. Rev. Lett. 57, 2268–2271 (1986). H. Larocque, J. Gagnon-Bischoff, F. Bouchard, R. Fickler, J. Upham, R. W. Boyd, and E. Karimi, “Arbitrary optical wavefront shaping via spin-to-orbit coupling,” J. Opt. 18, 124002 (2016). C. Zhang, G. Vampa, D. M. Villeneuve, and P. B. Corkum, “Attosecond lighthouse driven by sub-two-cycle, 1.8 μm laser pulses,” J. Phys. B 472, 6–10 (2015). L. Yan, P. Gregg, E. Karimi, A. Rubano, L. Marrucci, R. Boyd, and S. Ramachandran, “Q-plate enabled spectrally diverse orbital-angular-momentum conversion for stimulated emission depletion microscopy,” Optica 2, 900–903 (2015). B. E. Schmidt, P. Béjot, M. Giguère, A. D. Shiner, C. Trallero-Herrero, É. Bisson, J. Kasparian, J.-P. Wolf, D. M. Villeneuve, J.-C. Kieffer, P. B. Corkum, and F. Légaré, “Compression of 1.8 μm laser pulses to sub two optical cycles with bulk material,” Appl. Phys. Lett. 96, 121109 (2010). F. Kong, C. Zhang, F. Bouchard, Z. Li, G. G. Brown, D. H. Ko, T. J. Hammond, L. Arissian, R. W. Boyd, E. Karimi, and P. B. Corkum, “Controlling the orbital angular momentum of high harmonic vortices,” Nat. Commun. 8, 14970 (2017). M. Beresna, M. Gecevičius, P. G. Kazansky, and T. Gertus, “Radially polarized optical vortex converter created by femtosecond laser nanostructuring of glass,” Appl. Phys. Lett. 98, 201101 (2011). “S-waveplate (Radial Polarization Converter),” Altechna, https://www.altechna.com/products/s-waveplate-radial-polarization-converter/ . V. Cardin, N. Thiré, S. Beaulieu, V. Wanie, F. Légaré, and B. E. Schmidt, “0.42 TW 2-cycle pulses at 1.8 μm via hollow-core fiber compression,” Appl. Phys. Lett. 107, 181101 (2015). M. Seidel, G. Arisholm, J. Brons, V. Pervak, and O. Pronin, “All solid-state spectral broadening: an average and peak power scalable method for compression of ultrashort pulses,” Opt. Express 24, 9412–9428 (2016). 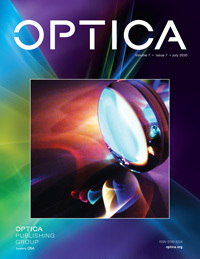 M. Sivis, M. Taucer, G. Vampa, K. Johnston, A. Staudte, A. Y. Naumov, D. M. Villeneuve, C. Ropers, and P. B. Corkum, “Tailored semiconductors for high-harmonic optoelectronics,” Science 357, 303–306 (2017). S. Quabis, R. Dorn, M. Eberler, O. Glöckl, and G. Leuchs, “Focusing light into a tighter spot,” Opt. Commun. 179, 1–7 (2000). Fig. 1. Setup of a few-cycle vortex beam generation experiment with a 1.8 μm laser source. P1 and P2, polarizers; Vpp, power supply for the q-plate; L, lens; HWP, achromatic half-wave plate for the central wavelength of 1.8 μm; QWP, achromatic quarter-wave plate for the central wavelength of 1.8 μm. The fiber is 20 cm long with a 150 μm or 250 μm core. The right lower two figures show the beam profile of the output beams after the fiber is put under vacuum and is filled with 8 bar Kr gas, respectively. Fig. 2. “Polarization identicality” of the laser beam before and after the q-plate. This measure is defined in the text and is an indicator of the conversion efficiency of the q-plate at a given wavelength, where values closer to zero indicate a higher efficiency. The blue and red curves show the identicality of the beam before and after the q-plate, respectively. Fig. 3. Compression of the radially polarized beam. (a) Spectra of the spatially polarized beam measured at four different spatial locations after the fiber compressor. The spectra of the lower, left, and right parts are similar, and the upper spectrum is a little broader than the others. (b–e) Temporal profiles (blue curves) and phases (red curves) of the laser fields corresponding to the four spectra in (a), measured using a FROG. The pulse durations of the lower, left, and right parts are 17 fs, and that of the upper part is 15 fs, which agree with their bandwidths. Fig. 4. Polarization measurement of the radially polarized beam. (a) Beam profile without polarization selection. (b–e) Beam profiles upon propagation through a polarizer, measured with a CCD camera for four different axis angles. Fig. 5. Wavefront interference scan and the focus beam profile. (a) Integrated intensity profiles for a full 360° scan. (b) Interference signal for one point of the beam as a function of HWP angle. (c) Phase retrieved for different points on the circle’s circumference. (d) Focus beam profile of the compressed radially polarized beam.